Park Place specializes in real estate referrals. Once we have your information, we can then do the research to find out who the top real estate agents are in your market with our database of over 1 million real estate agents. When we find the right fit for you, we will reach out to them to make sure they are willing to work with our program. Rarely do we have an agent turn us down as we can send them plenty of future business. The U.S. Dept of Justice legally allows real estate companies to rebate a portion of the real estate commission in 40 U.S. States back to the party of the real estate transaction only without a real estate license. Real Estate Brokers will not pay back this rebate unless there is a connection. We provide real estate companies referrals from our 600+ active real estate agents. 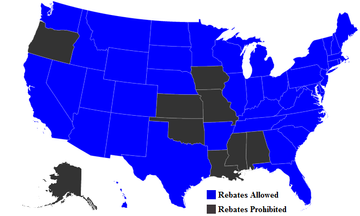 As long as you are in one of the below states that allows a real estate rebate, we will get the broker to rebate you back 15% of the total gross real estate commission as closing. Fill out the Application to work with a Top Agent who will Pay You Back 15%. What State will your Transaction be in? Get more information on the FAQ's page here.